The purpose of this project was to develop an oilcloth formula to waterproof fabric. The project consisted of three objects: the hat, the jacket, and a carry-bag. Recently I ordered a camera bag made by Domke. It was a "Limited Edition" F-2 camera bag made with Waxwear, a trade mark product. This is fine bag which is well made and is perfect for "on the go" photography. The material is a water-resistent finely-woven cotton. Other names for this type of fabric are oil cloth and tin cloth. Filson makes a number of products with the their own version of oil cloth. Other manufacturers like Beretta, Orvis, Schaeffer, and David Morgan market clothes with this type of fabric. I used to have a jacket made of oil cloth which was manufactured by Browning. At least, I think it was Browning. It was my favorite jacket for about ten years at which time I lost it. I really miss that jacket and if it was indeed made by Browning, they no longer carry it. I began thinking about how one might go about "tinning" a piece of clothing. 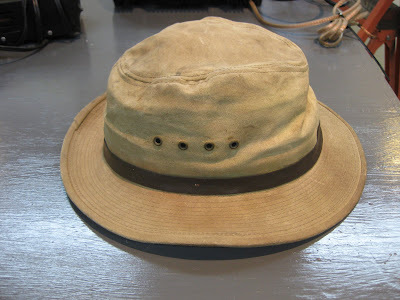 It occurred to me that I had a Filson Packer Hat that had been beat up over several several seasons of yard work. 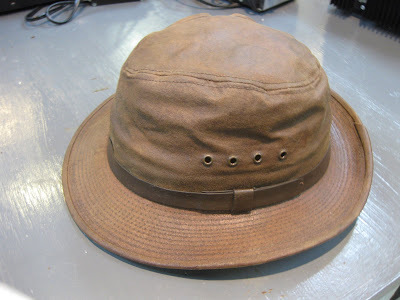 The hat had seen its better days so I tossed it into the wash machine (something never to be done to oil cloth) to remove the "big dirt." Despite an extended search, I only found two oil cloth recipes on the Internet. One was a 1998 post by a Roger Lahti in which he discusses, in somewhat approximate terms, the necessary ingredients. In 2003, Bob Smalser posted an article showing how he invigorated several pieces of worn clothing with his oil cloth recipe. As Bob says, the proportions of the ingredients are not critical but different amounts will yield different properties in the finished product. Essentially, I used Lahti's recipe and reduced it to yield about 2.5 cups of solution. Oilly rags will spontaneously ignite if not disposed of properly so take the necessary precautions. Shave the bees wax into 1/2 inch pieces...the smaller the pieces the faster they will melt. Put the linseed oil, bees wax, and paint in the container, heat and stir until all ingredients melt at a simmer. Probably the safest way to do this is with a double-boiler. I used a hot plate in the shop and heated the container directly but watched the heat carefully. Carefully remove the container from the heat and let the mixture cool. I placed the can in the shop sink which was partially filled with cold water to hasten the cooling time. Once the mixture has cooled, stir in the mineral spirits. This dilutes the contents and allows the mixture to be spread. Use a chip brush to spread the mixture liberally onto the material. As it is applied, it will dry and appear waxy. That's OK. Cover the entire object. Use a heat gun on the low setting (a hair dryer might work) applying even heat to sections of the fabric. 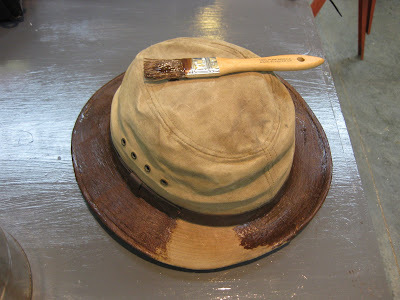 The wax mixture will melt into the fabric and coat both sides with the wax, oil, and color (although the thick brim of my hat required coverage on both sides). The mineral spirits will boil off. Let the material dry for a couple of days outside or in a well ventilated room. I wanted the hat to be a dark chocolate color. Because I did not use enough paint, after the first application it was milk chocolate. I added more paint to the mixture and heated it to dissolve the paint. I found that I needed to stir it more briskly for the paint to dissolve. I used a stick but a kitchen whisk would have been better. 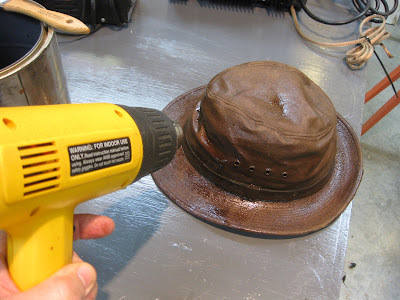 After recooling, I added more mineral spirits and repainted the hat and followed up with the heat gun. Because it previously saturated, the hat stubbornly took some of the new mixture and only darkened slightly. I had to blot off the surplus mixture with paper towel: a messy process. The point is that there is little opportunity for color change after the original application without starting over. One alternative would have been to try the mixture on a piece of similarly colored scrap canvas like when trying stain on wood. Hat after washing but before treating. I ran across an article by Pekka Huhta regarding Linseed oil impregnation on wood boats. It is not clear how similar the properties of wood compare with those of cloth but Pekka comments a dash of wood preservative. However, wood preservative attains mold preventtion at the cost of hazardous chemicals. So the choice of it to prevent mold in cloth is questionable. Another option is pine tar as a mold prohibiter.